When it comes to who Spence Junior, 20-0(17) might fight next, DiBella made it abundantly clear he fears no welterweight when it comes to matching his dazzling star. DiBella went as far as to challenge all-time great Floyd Mayweather Junior to come out of retirement to face his fighter. That one has absolutely no chance of happening, but when it comes to Spence Junior challenging one of the current 147-pound champions, there are big fights that can be made. However, when it comes to Spence Junior fighting Kell Brook, for whom he is the IBF mandatory challenger, DiBella said he is not so sure Brook will take the risky fight. Kell Brook now has to decide what he wants to do. The Sheffield fighter has long been complaining how none of the big guns will agree to fight him. Spence Junior is not a huge name yet, but he looks to many people – DiBella included of course – like a definite star of the not too distant future. Will Brook take the fight or might he avoid Spence and vacate the title; this after taking two less than appealing mandatory fights he had to take so as to hold onto his treasured IBF belt? Spence Junior clearly wants the fight – he said at the press conference how he is “not scared” of traveling to the UK to fight Brook – but will the fight be made? DiBella also spoke of how Spence Junior will be in the audience at the June 25th Keith Thurman-Shawn Porter fight and that the winner will “have to look down into the crowd and see him.” DiBella, who said he thinks Spence Junior should, in his opinion, be ranked in the top-10 pound-for-pound charts even at this still relatively early stage in his career, also insisted his fighter would defeat Manny Pacquiao. 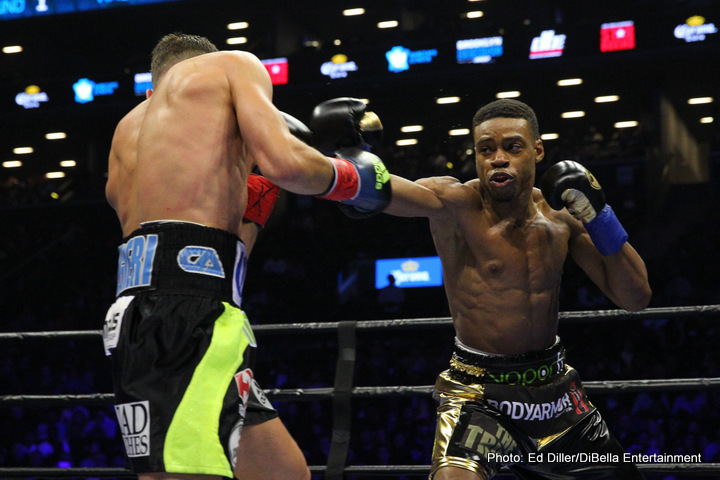 If Spence Junior is as good as DiBella thinks he is – and so far there is every reason to believe he might be – the hardest obstacle he may encounter is getting the big fights his considerable talents deserve.